Flat Stanley Goes Mobile; Will He Visit Your Site? 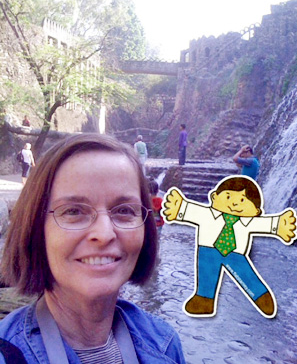 Flat Stanley with Suzie Boss in India. From Edutopia.org. “Flat Stanley,” the elementary school activity that’s designed to get students to explore places around the world, has moved from a paper-cutout to a clever smartphone application. He can now be integrated into a phone’s camera to be part of photos taken in places visited by children–the result of some clever computer programming and a legal agreement with the estate of the author. Read more at Suzie Boss’ blog at Edutopia.org. This entry was posted in Social media, Technology and tagged Flat Stanley on November 22, 2011 by Max van Balgooy.